The goal of our education program is to provide a caring, welcoming and supportive environment in which the entire family can learn. The Inn’s education program offers support for children to keep up with their studies, complements the educational services offered by the NIH School, and not only provides the opportunity to learn a new language or skill but also for families to participate in interesting and engaging activities together. The Learning Center is where it all happens! The Inn offers one-on-one tutoring sessions which can be scheduled prior to your visit or upon arrival by completing a Tutoring Request Form. Tutoring services include, but are not limited to: homework support, reading instruction, English instruction, Spanish instruction, SAT preparation, assistance with the college application process, and much more. Each week, our residents have the opportunity to participate in various educational activities at The Inn. These programs provide residents great opportunities to meet new friends while motivating them to learn in engaging and diverse ways. A schedule of our education programs can be found by viewing our Activities Calendar. Need help with homework or just something fun to do? Study4Fun provides the opportunity for children of all ages to bring their homework to the Learning Center and receive support from a certified teacher. Don’t have homework? Come anyway and play educational games, use the SMART board or read a book. Study4Fun takes place on Mondays and Wednesdays from 3:30-4:30 p.m. Parents are welcome to drop off their children for this program as long as they remain in the building. You know what always makes learning fun? Snacking on your favorite treat! Snack & Discover gives you the opportunity to learn something new while enjoying something tasty. ExploreINN is a program sponsored by scientists from NIH or other members of the community that provide thrilling science experiments for Inn kids. Come test for acids and bases, learn how ink can disappear, explore surface tension, make goop and much more. AdventureINN provides the opportunity for the whole family to take field trips to DC or other fun places in Maryland and Northern Virginia. Come with us as we experience and explore museums, impressive monuments and other historical landmarks. 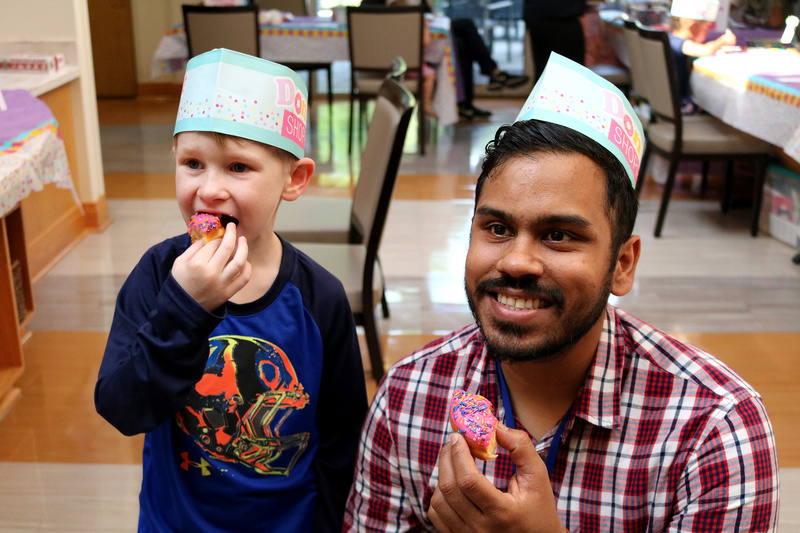 The INNrichment Fund enables residents of The Children’s Inn with life-disrupting illnesses to participate in an experience or activity of their choosing, by providing financial assistance for tuition and/or material costs. In addition to providing educational services and programs, residents also have access to additional educational resources in the Learning Center. The Inn has: computers, educational games, Rosetta Stone in English, books, backpacks filled with school supplies, assistance with the school re-entry process, special education support, and special education resources. To learn more about our education programs and services or to schedule a tutoring session, contact Javin Smith at [email protected] or 301-827-6076.